IBM Client Vantage is a multi-platform application to digitally present key information and can include a metric dashboard. 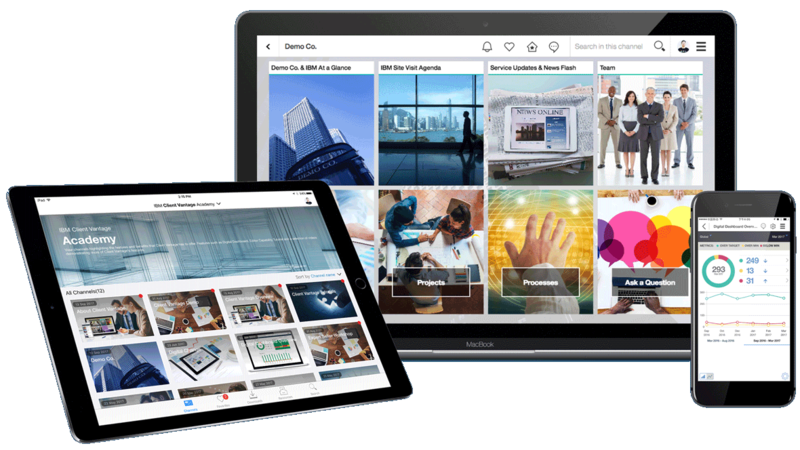 It is more than a content management tool because it adds the dimension of interactivity – making presentations more engaging and collaborative. You can pull together blogs, videos, documentation, interactive tutorials, website links, calendars, agendas and more. Client Vantage collects all this data into a digital interface so all your information is easily accessible in one place. While it is a mobile app, it is also available on a browser. Client Vantage is multi-platform. Use your smartphone, tablet, computer browser – or download your content for offline viewing. Manage your metrics on a digital dashboard, with commenting at the metric level. Get alerts on your mobile device when reaching your defined thresholds. Easily create and update your channel with drag and drop functionality. Customize your channel to fit your image or to meet the needs of your client. The app provides seamless navigation to pertinent content and the ability to view web pages and videos within the app – or download content for offline viewing.